TAK-243 is a potent and selective ubiquitin-like modifier activating enzyme 1 (UBA1) inhibitor. Petesicatib is a cathepsin inhibitor drug candidate. 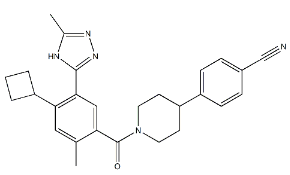 RMC-4550 is a potent, selective and allosteric inhibitor of SHP2, with an IC50 of 0.583 nM. GLX351322 is an inhibitor of NADPH oxidase 4, and inhibits hydrogen peroxide production from NOX4-overexpressing cells with an IC50 of 5 μ M.
Dabigatran Ethyl Ester Hydrochloride Salt is a derivative of Dabigatran, acting as nonpeptide, direct thrombin inhibitor. Anagrelide is a drug used for the treatment of essential thrombocytosis (ET; essential thrombocythemia). It also has been used in the treatment of chronic myeloid leukemia. Aminotadalafil is an analog of Tadalafil as a phosphodiesterase type 5 (PDE-5) inhibitor. Betrixaban is a highly potent, selective, and orally efficacious factor Xa inhibitor with IC50 of 1.2 nM(inhibition of Factor 10a). 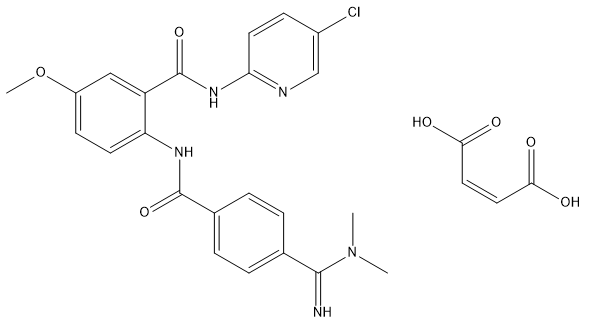 TVB-2640 is an orally bioavailable fatty acid synthase (FASN) inhibitor, with potential antineoplastic activity. IDH-305 is an inhibitor of isocitrate dehydrogenase (IDH).